Kerala is known as 'Keralam' and 'God's Own Country' is a state in South west region of India on Malabar coast.Sadya is a famous feast meal of the Keralian traditional cuisine, which is mainly served during Onam festival and also in various special occasions. 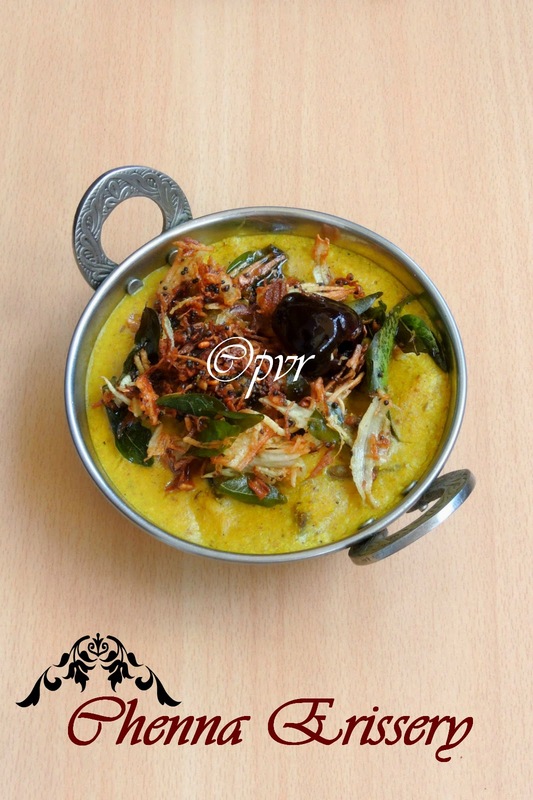 This meal is a strictly pure vegetarian, which is served to the guests with rice and other delicious side dishes. Payasam, which is also called Ada Pradhaman is also served in Sadya and it is actually a dish made of sweet milk, mixed with cooked rice pieces called ada,which is prepared with steamed rice paste and cut as small pieces, is favourite to people of Kerala.Various other popular traditional Keralan food items goes for Boiled rice, Parippu, Kaalan, Sambar, Aviyal, Theeyal, Pulissery, Thoran, Puliinji, Olan, Mooru, Pappadam, Sharkara upperi, Kaya upperi, Appam, Puttu a Steamed Rice Cake, Kappa aka Tapioca, Banana Paayasam and Puzhukku, all these are served in a banana leave for Sadya.Kerala foods are extremely prepared with coconuts, thus they have the distinct flavour and various spices are also used in this cuisine. 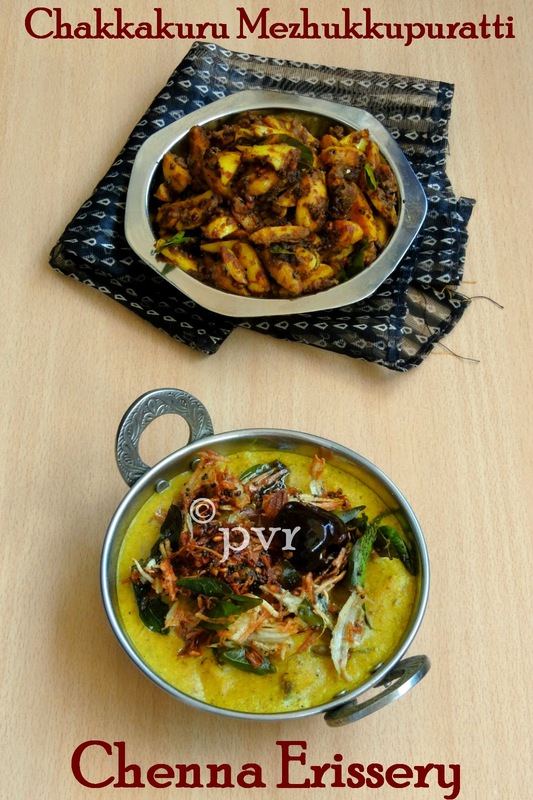 Now coming to Kerala's non vegetarian dishes, they are quite famous, the biryanis made by the families in Thalassery are very popular, the traditional dishes of Kerala cuisine includes cooked tapioca along with fish curry called Meen molee, rice congree and cooked moongbean called payaru. Some tradition dish have their influence from Arabic cuisine, a type of pancake cooked with rice flour called 'Pathiri' is said to be originated from 'fateerah' which means Pastry.Also Harees, an another Arabian dish cooked with wheat,chicken or meat is also popular too.Kerala is the only state in India where there is no communal distinction between the different foods. People of all religions share the same vegetrian and non vegetarian dishes. 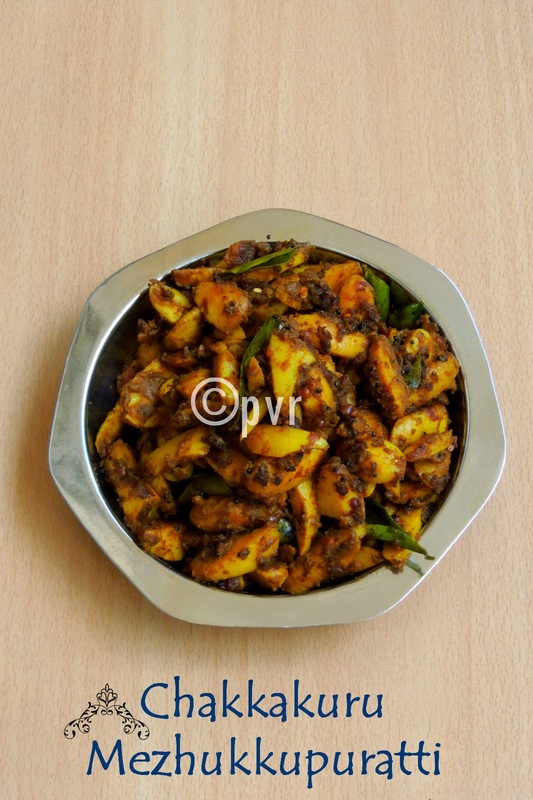 For my today's Kerala special, i cooked chenna erissery aka elephant yam curry along with a simple and delicious jackfruit seed stir fry.With a bowl rice, these both dishes tastes absolutely fantabulous. Grind the grated coconut and cumin seeds as fine paste,keep aside. Take the cubed yam pieces with turmeric powder,pepper powder,salt and enough water in a pan, cook everything in medium flame until the yam pieces gets cooked. Add the grounded paste to the cooked yam pieces, bring to boil, put off the stove. Heat the oil in a pan, add the mustard seeds,urad dal and dry red chilly fry everything until they turns brown. Add the scraped coconut, fry it until turns brown. Finally add the curry leaves, pour this tempering to the already cooked erissery..
Cook the sliced jackfruit seeds with turmeric powder with enough water in medium flame until the seeds gets well cooked. Heat oil in a pan, let splutters the mustard seeds, add the curry leaves and fry. Add the cooked jackfruit seeds, chilly powder, salt. Cook in simmer until the jackfruit seeds gets well coated with the spices. Chakkakuru Mezhukku puratti and Chena erissery make me drool at this night even after having my dinner. Chakkakuru reminds me back home my moms dishes. lovely witeup about Kerala akka, the jackfruit curry looks very pleasing to me..
delicious erisery n jackfruit stir fry!!! I love both the dishes priya..looks so nicely done! Both the dishes look tempting, though I have yet to try eating jack fruit! Happy New Year to you as well. The preparations look awesome. Happy New Year to you & your family. Traditional dishes look very nice. Chena erissery looks delicious... never been a fan of chakka kuru but this mezhukkupuratti really tempts me.. They look very tasty and flavourful! yummm!!! cant think of words to say, it looks too good!!! looks very yummy combo,love it! !Happy New Year!! Never cooked any dishes vth dis veg.but pics r tetmtping me more n lovelY presentation .. Delicious dishes, I have to try out the jackfruit seeds curry, very tempting..
such a beautifully well written recipe, info , lovely blog to keep coming back to often. Jackfruit curry is to die for. lovely masalas. We used to have boiled jackfruit seeds with salt. I had never heard of this dish before. Very interesting. Love both the dishes. I am going to try the curry. Love them both. I had also planned to make eriserry but logistics didn't work out. I made eriserry some months back but with pumpkin and plantain since I am allergic to yam. both your dishes look so good!!! Both the dishes look so yummy. I'm going to try that jackfruit seed curry very soon. I love jack fruit seeds curry a lot and erissery is my fav from onasadya such an comforting combo I wud love to finish with steamed rice right away :) very delicious recipe choice again aks ! !